If I learned one thing from Ironman racing, it is how to survive a race. I’ve learned how to overcome pain, fatigue and a desire to quit and make it to the finish line. Today’s NYRR 18 miler caused me to dig deep and force myself to the end. I don’t think I’ve ever felt the desire to bail out on a race as much as I did today. I am only mildly satisfied, that I pushed onto the finish. I don’t have that large sense of accomplishment as I have in past races, when I persevered through the final mile. I suspect that if I let myself quit I would be sitting here now with a big sense of failure. However, with this completion, all I really have is the feeling “I am glad that is over” and the bewilderment over why running seems to be so hard for me lately. I just haven’t been feeling right. My legs feel as though they are completely worn out and over trained, despite several weeks of easy workouts or days off. I could tell as soon as I started to run today that I would not be able to run with a decent pace. It is as if all Fast Twitch muscle fiber has left my body. By the time I finished, my legs were sore, my toenails were bleeding and I just felt like going home. I started out at a moderate pace for the first 8 miles, varying between 8’s to 7:45’s. 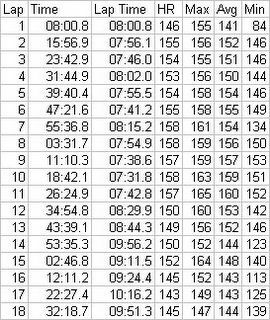 Miles 9, 10 and 11 were 7:38, 7:31, 7:42 respectively and pretty much the beginning of the end. From that point forward, the fastest I could muster was an 8:29 and that was on mile 12. Sometime after mile 12, I took a page from the Ironman marathon playbook and walked through a water station. I was pretty much content to pack it in and walk back across the transverse to the baggage area. Somehow, I managed to start running again and headed south to 72nd street. Once I crossed the 72nd Street Transverse, I knew I would finish the race, if only because I had to head to the finish in order to claim my belongings. I no longer had a cutoff that would take me back to the finish without having to complete the course. Someone during these last few miles overheard me saying to myself “I can’t do this anymore” and offered me encouragement by saying “That yes I can”. It was little solace. I knew I would get to the end. What I really meant by that saying was I can’t be running as this slow lethargic pace any longer. I need to figure out what is wrong with me. My one consolation for the day is the fact that I am not doing the SOS Triathlon tomorrow. With how I ran today, I think it is questionable as to whether or not I would be able to complete it. Fortunately, I had to cancel this year’s entry into SOS because of a family engagement. Besides my one walking water break, I made several other pit stops along the way. Twice to urinate in the bushes and once to chat with a friend that I hadn’t seen in a long time. I couldn’t have cared less about the couple of minutes I spent speaking to him or the numerous runners that passed me while I lollygagged. It was the most pleasant part of the race for me, especially when he said that after doing IMLP, all I should be doing right now is lying around and eating Twinkies. Maybe he is right. I think today was hard on a lot of runners. I worked out in Prospect Park, which should have been packed with runners and bike racers - slim pickings tho. Saw a lot of people walking. Maybe it was the air today or something. Lots drier than we've all been getting used to the last couple of months.